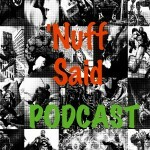 The 'Nuff Said Podcast is a Marvel-centric show that covers Marvel comics, TV shows, and movies. Starting September 24, we'll be covering the most anticipated new show, Agents of SHIELD on ABC. That's right true believers, the Nuff Said Podcast is your new home to geek out on everything Marvel.